The Naot Moldova is a unique clog with a contrasting leather design. This style has gore at the instep and a padded upper. 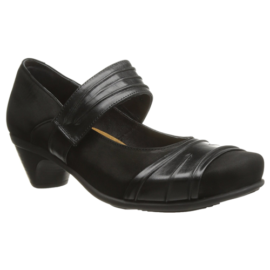 The moldova has padded technical lining by the toes for comfort warmth and moisture absorption. Naot’s removable anatomic cork and latex footbed is wrapped in pampering suede and molds to the foot with wear. The cosmopolitan collection features a 2″ polyurethane sole with a metal shank and is extremely lightweight and durable.